Here is a timeline of events into the end of 2012. I place more weight and validity on some of these than others, but it helps to lay it all out. If I’ve missed something you consider important, let me know. Drawing it all together, if we don’t see a crash into this coming weekend (Carolan’s work as highlighted by readers), a little consolidation here in mid-October would be normal seasonally, and is perhaps fitting as we await the ‘theme’ of US earnings (which will not become clear until next week), and for the US election polls to make their telling late swings. Based on the latest odds, President Obama will be re-elected, and this fits with the stock market having made its largest historical gains under his Presidential term. 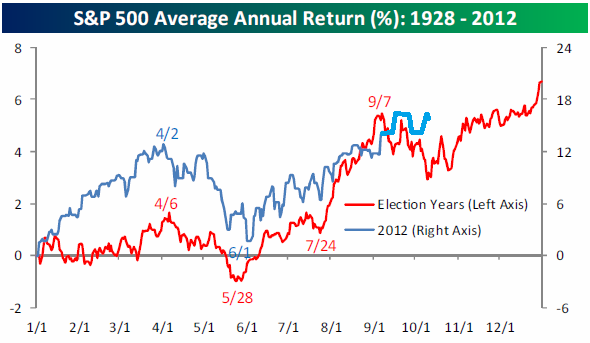 Furthermore, in this scenario historically, a re-elected Democrat President has led to bigger subsequent gains in equities than a switch to Republican. So, as things stand, the rally around the election that has been historically normal, may indeed come to pass again – assuming the polls suggest Obama to win, followed by his actual victory. Perhaps an associated US Dollar rally around the elections could fit with a consolidation in commodities, before they embark on a major rally, as per Gann. The fiscal cliff will then come back into focus, and we will see whether the fiscal tightening is allowed to come to pass (which will be negative for the economy) or whether it is postponed or amended. Whilst no President will want to risk sinking a precarious economy, the first year of a Presidency is often used to implement unpopular policies. We have a market top forecast by Eurodollar COT futures at the end of November, together with a Puetz crash window. Whilst Puetz windows have been very hit and miss, the two combined adds more weight. I am expecting a cyclical bull top in equities ‘soon’ (based on secular and solar anytime as of now through to Q2 2013), but want to see the usual topping indicators present, e.g. a topping range with negative divergence in breadth, overbought and overbullish readings, yields and inflation up, leading indicators and economic surprises trending down. So if enough of these are flagging by late November, which would fit with Eurodollar COT plus Puetz, then I’d be getting out of equities. However, if reflation is just getting going currently, then that may be too soon, and we might look to beyond the Santa (benign geomagnetism) rally of December/January for a top (unless geomagnetism is unseasonally bad). Bradley Turns I also find very hit and miss, but if 22 Dec is to be valid, then by the theory it can be a top or a bottom. If equities top out late Nov and make a Puetz crash then 22 Dec could mark a bottom, and this would roughly coincide with a bottom predicted by Eurodollar COT. If technical and macro topping indicators are absent in late Nov, then maybe stocks could make a top 22 Dec. Well, with all these potential markers and triggers, we will get more clues as we move through the checkpoints in October and November. To return to where we stand this week, US earnings will begin, as will the Carolan crash window. I find it hard to produce a case for a crash at the end of this week. In the US, economic surprises have moved up to a new high for H2 2012, as have ECRI WLI leading indicators – both are decisively in the positive and trending upwards. Global leading indicators have improved, and it would take a quick and major reversal to bring about a market panic. Rather, reflation is likely due to 6 months of central bank rate cuts and renewed stimulus, and with leading indicators tentatively reflecting this, I rather expect the markets to await more data. Euro debt remains subdued, and US earnings (by relation with ISM PMI) are most likely to be unimpressive but above expectations. Lastly, we don’t see topping indicators aligned in equities – there are a couple of flags but not enough to mark a top. We see excessive frothiness in gold speculation but given its 9 month coiling prior to this current rally, I expect a consolidation only. The reflation I expect (assisted by the collective central banks effort), and see tentative evidence for (in leading indicators and assets), fits with solar cycles: an inflationary finale in 2013. To be more precise, we should see pro-risk rise strongly before commodity rises become excessive, killing off equities and tipping us into recession. Treasury yields should rise into the cyclical bull top for equities, and the longer term treasury channel action that I have previously shown suggests that should indeed occur over the next 12 months (supported by Gann projections too). Because of this cross-referenced picture, I don’t side with an imminent top and crash in equities, but remain open to one if the usual topping signals and indicators align. So as always, one day and one data item at a time, but I rather believe we are heading for an inflationary speculative froth before anything bearish and deflationary occurs. If solar cycles do fulfil, then there are other associated expectations leading into 2013’s solar maximum. One, solar maximums are correlated with increased earthquakes. Should a major earthquake occur, then the implications for the markets would depend on location, but earthquake occurence could help tip the global economy into recession. Two, solar maximums are correlated with protest and war. Should conflict increase in the world then it could both assist in tipping the global economy into recession and also in fulfilling the secular commodities bull conclusion, if energy and food are affected. Iran has remained in the spotlight due to its potential for energy supply disruption and conflict in that region of the world. Now, hyperinflation has taken hold, with monthly inflation up to 70%, in part due to the sanctions imposed on the country. Internal social unrest has begun, and is likely to escalate. Historic examples of hyperinflation correlate with subsequent war and social/political upheaval. Refuge is also sought in gold, and Iranian gold purchases have been escalating in line with the currency debasement. I believe these circumstances could play a key role in fulfilling solar cycle predictions of a secular commodities and inflation finale next year, anticipating regional conflict around Iran, oil supply disruption and oil price escalation, and the knock-on effects for other commodities. This could be viewed as either solar maximum conflict and war fulfiilling a solar maximum inflation/commodities blow-off top, or the other way round. Certainly, now inflation has escalated out of control in Iran, there isn’t going to be a way back, so it’s a question of how the social and political impacts unfold from here. I’ve only just started reading about the Iranian hyperinflation story, it’s a pretty nasty way of getting countries to do the US’ bidding, wrecking their currencies beyond repair. If now is similar to late 1978, a revolution of some sort is likely in a matter of months, as was the case in early 1979. In this way, the markets could be greatly impacted by sharp oil rises and stocks would correct much like they did in early 2011, but more severely, since conflict in Iran has always caught the attention of speculators and the public. I’m not entirely sure about the events which surrounded the 1980 gold peak. Can anyone enlighten me as to what factors led to the gold mania and the spectacular crash that followed? The PMs mania of 1980 was several factors coming together: Iranian revolution, OPEC supply side oil, Hunt bros cornering silver market. The plunge down the other side was also a combination: extreme overvaluation, normal pattern post-parabolic, plus rule changes made against purchasing commodities on margin. Your post states that there will be a late November market top predicted by Eurodollar COT futures. Can your provide a reference as to where you obtained the information? Thanks. I did google Tom Mclellan and Eurodollar COT and the research indicated that the S&P may top around November 2012 but the indicator also appears to dive down in 2013 which may mean that equities also take a dive. 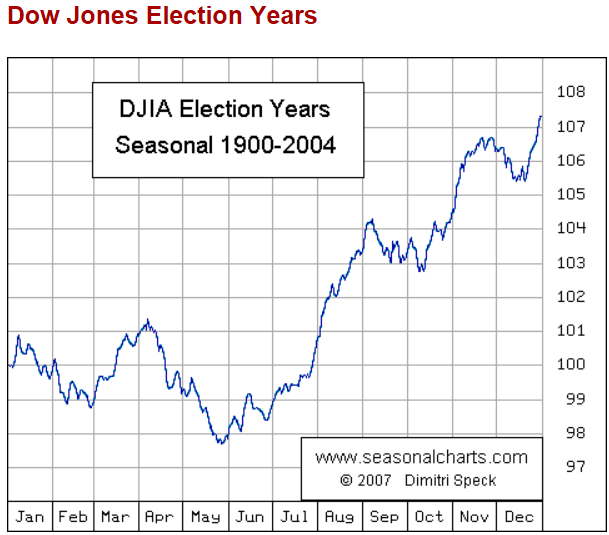 John, I think that this scenario of stocks falling in 2013 may agree with your previous predictions. Nice Update John. Thank you! All models updated. Geomagnetic storming in progress since yesterday. Thanks a lot, I see your models as good forecast in the medium term.